Stand Up for SINGAPORE: Confusion over population target continues: 4, 5, 5.5, 6, 6.5, 6.9 million? Confusion over population target continues: 4, 5, 5.5, 6, 6.5, 6.9 million? In October last year, this website published an article about the lack of clarity of the Government over the target population size of Singapore. 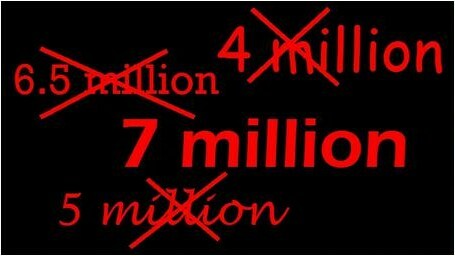 The announcement this week that PAP intends to raise this to 6.9 million has only added to the confusion. In 1991, under former prime minister Goh Chok Tong, the Government published its blueprint for Singapore called The Next Lap in which it stated that a 4-million population was a comfortable figure. Mr Mah was then contradicted by then Minister Mentor Lee Kuan Yew who said in February 2008: "I have not quite been sold on the idea that we should have 6.5 million. I think there's an optimum size for the land that we have, to preserve the open spaces and the sense of comfort." He projected, instead, an optimum population size of 5 to 5.5 million for Singapore. In April 2011 (just before the general elections), Mr Mah walked back his own statement, saying that the 6.5 million number is not a "target" but rather a "planning assumption." Why would the Government be planning to house 6.5 million people if it did not target that number? A little over a year later in September 2012, Prime Minister Lee Hsien Loong changed the number: "Today our population is over 5 million. In the future, 6 million or so should not be a problem." Today, Mr Lee gives us yet another figure: 6.9 million. The Government's former chief statistician, Dr Paul Cheung, states a different figure: 8 million. 4 million, 5 million, 5.5 million, 6.5 million. 6.9 million, 8 million - who comes up with such numbers and how are they arrived at? The constant changing of the target does not inspire confidence, at best, and, at worst, demonstrates total confusion within the cabinet. PM Lee even admitted that his administration lacked the foresight in population planning. In 2008, former foreign minister George Yeo had given us a glimpse into how unprepared the PAP was when he said that the Government needed to come up with a "masterplan" to give "some idea of how many foreigners we can accommodate in a sustainable, organic way.” The statement came after Mr Mah announced in 2007 that his ministry had done a review and found that we could house 6.5 million people. This confusion doesn't bode well for our future. Has the PAP thought through how such a huge population increase will affect the infrastructure? How will the influx of massive numbers of foreigners affect the social cohesion and overall livability of this island? With half of our population made up of non-Singaporeans, how will our national security be impacted? These questions must be answered before we commit to a 6.9 million population and, in the process, do this nation harm, perhaps irreparably.